Our ultimate goal is to establish a long-term business relationship with each of our clients through maximized collections, consistent revenue performance, and excellent customer service. Teamwork - our staff of highly experienced billing professionals work as a team to reach consistent 100% collection rates. Knowledge & Continued Education - as the administration side of health care continues to evolve, we evolve with it. Technology & Solutions - MPS is a forward thinking medical billing firm constantly looking for the next solution to help your Practice succeed and grow. Welcome to the MPS and thank you for taking interest in the services we have to offer! I am proud to be the founder and leader of Medical Professional Services. I started this company over 16 years ago because I recognized that health care administration, especially billing, was a real problem for so many practitioners. Changing laws, regulations, shrinking reimbursement rates, managed care – everything was stacking up against medical doctors. They needed help and they needed it fast! 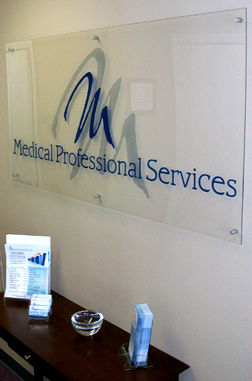 I can’t tell you how many times I’ve been personally told by clients “I don’t know what I’d do without you!” That is a comforting and satisfying testimonial that, when you sign up with MPS, you are getting an entire team of experienced billing professionals who will work hard to make your practice a success. What a nice feeling to be able to sleep at night not having to worry about cash flow problems, mounting A/R figures, and other issues! Our company is family-owned and operated. We are not a large billing company on purpose - our focus is superior customer service to our clients and their patients and by growing too large, we do not want to take the risk in losing the quality of service we pride ourselves on. We cater to small to medium-sized practices (1-10 providers). We take each client by the proverbial hand and work with each one to implement a smooth, seamless link between their office and our offsite billing operation. Many clients admit that they were initially apprehensive about outsourcing their billing because they feared “losing control” of their practice. With MPS, our clients have total access to their data on a 24/7 basis and are given comprehensive reporting with analysis provided so they fully understand the billing cycle and what the numbers actually mean. Moreover, our staff is our second family. Our office is congenial, casual but professional, and we greet every patient phone call with a big “Hello! How may I assist you today?” We go the extra mile because we know that we represent you, the physician, and we take that responsibility seriously. So, if you are contemplating making the move to a billing company or if you are not pleased with your current billing company, please give me or my son, Cliff, who is Vice President of Operations, a call at (703) 249-8500. We would love to speak with you to discuss your billing options. You may also fill out a brief practice questionnaire (Request a Proposal) for a confidential, no-obligation quote. Thank you for visiting – we hope to hear from you soon!